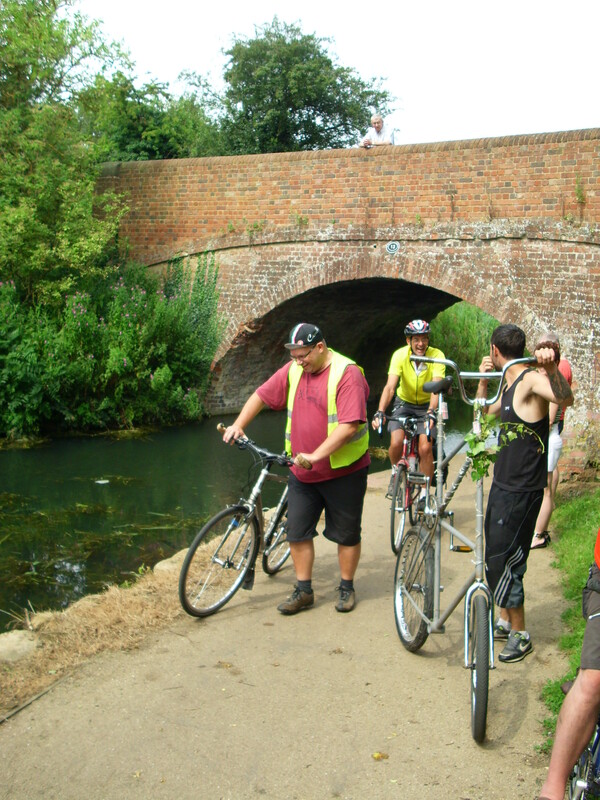 This will be a ride of 55 miles, starting at Moulton Co-Op at 9.30 a.m.
Bill Simpson will lead the ride, via Burton Latimer (elevenses), to Oundle (lunch) and return. It looks set to be a warm weekend so we look forward to seeing you! More details from Bill on 07736 600858. David and Philip attended this event with other CTC members. Words by David and Philip. Photos by David. This really was really rather special with a varied and unusual programme. Beckett’s Park was a great venue to host the event. 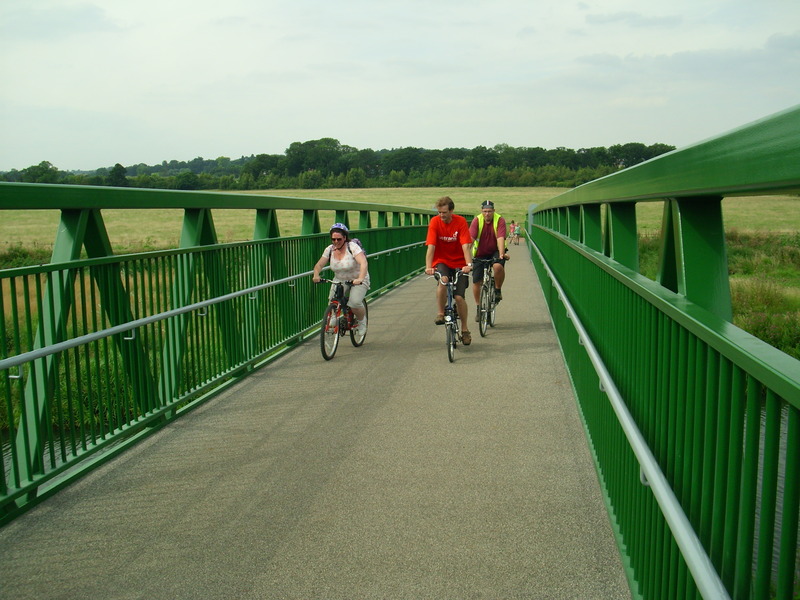 Cycled over the new Connect2 bridge, opened by the Mayor of Northampton, with the Sustrans Area Manager. 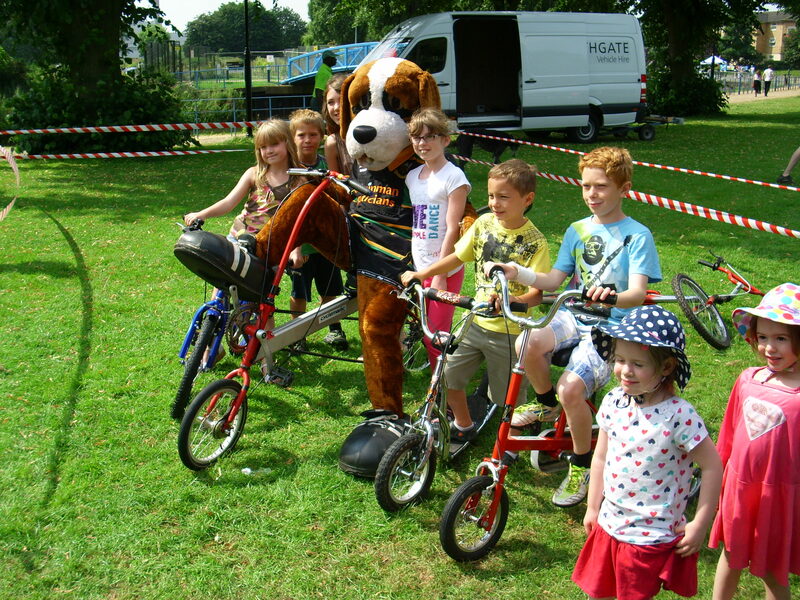 There were guided rides led by CTC volunteers. Watched the Olympic mountain biking on the big screen. 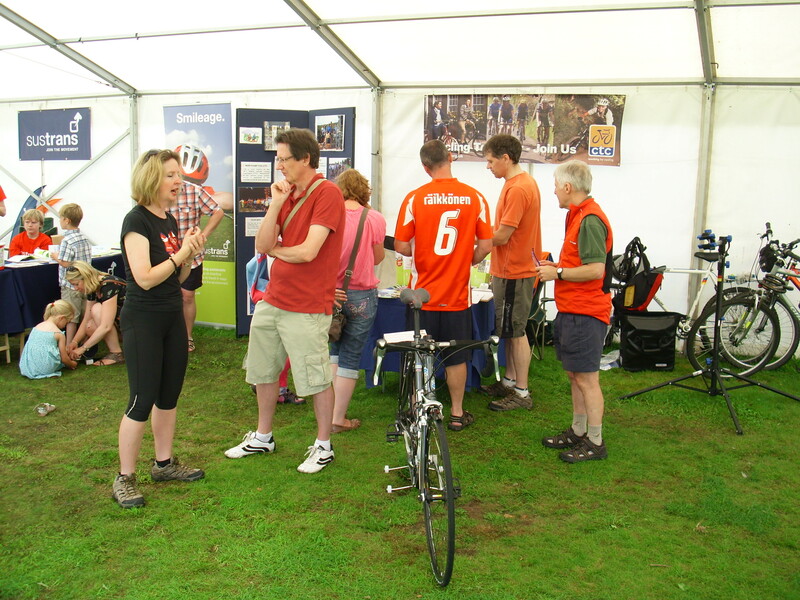 Plenty of interest at our CTC stall, which included a quiz with a prize donated by Pitsford Cycles. Warm enough for a ice cream. 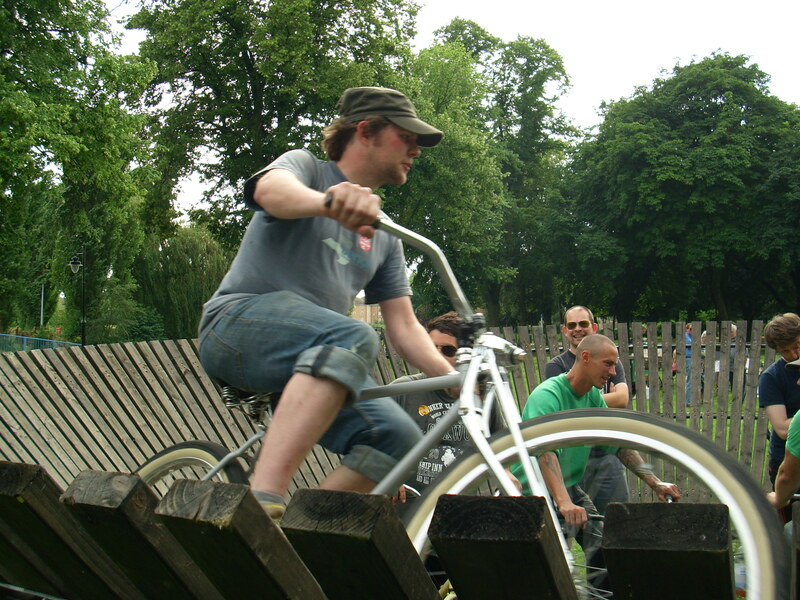 Saw Michael Ellis (MP for Northampton North) try cycling around a wooden platform named “the wall-of-death bomberdrome”. Tried a bike and fell of when the handle bars twisted round. Lots of people there. Overall this felt like the best cycle-focused event held in Northampton for many years, and something that hopefully will encourage more people to participate in whatever way best suits them. The organisers are hoping to run the event again next year. Many thanks to Iain, Brian, Rowan and Dave for their help in setting up and running the stall, and to others for dropping by. Is this the most soul destroying debate in cycling? Is this the most soul destroying debate in cycling?. A good piece by Kevin Mayne on the debate about h*lm*ts. Four riders assembled at East Carlton Country Park to attempt “A Hilly 100”, an Audax-style event organised for CTC Northamptonshire & Milton Keynes by Max Scott. Denise (from Daventry) is an LEL lady and so she just left us at the start – and probably didn’t stop for anything. Elevenses? Lunch? Clearly for wimps. John Weller was also quick and determined but did stop for elevenses! Bill Simpson was very kind and accompanied me around the route. We enjoyed elevenses at Sweethedges near Stockerson and, at Bill’s suggestion asked for fresh sandwiches for lunch en-route. (So I wasn’t slowed down, as last year, by a couple of pints at Tilton-on-the-Hill! And, as a result, pedalled Max’s complete course.) Afternoon tea at Church Langton certainly didn’t disappoint – sitting “in the body of the kirk”! After 64 miles – like cycling over a giant egg box – with over 4,200 ft of ascent (at least) – I was weary but exhilarated on return to the Country Park. You can see the route on Endomondo here – the ascents and descents are different because the app uses GPS for these and, I think, more accurate measurers (Garmin) uses barometers as well. Why not tackle this event next year? It’s a serious challenge but well worth achieving! Many thanks to Max! And my own personal thanks to Bill!